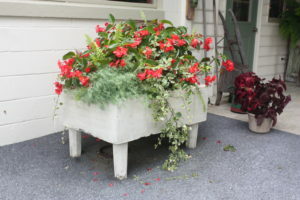 During the month of May, gardeners throughout the northeast start their container gardening. The weather is now warm enough for plants to survive night temperatures. An average gardener fills two or three containers with plants that frame the doorway on the front porch. The containers are typically cylindrical shaped or look like an urn. They may have raised ornamentation, stand on a pedestal, but the shapes are generally similar. While this may be the norm, there is no reason why everyday objects cannot be converted into unique flower containers. Why throw out that old coffee pot when you can fill it with a geranium instead. The grill on the back porch broke. Instead of tossing it, load it up with potting soil and grow large vining plants. Left over PVC pipe, from your home’s latest plumbing project, has two open ends where trailing petunias would look great. The same goes for the empty paint containers; they have a large opening for a single plant and you can drill drainage holes in the bottom. Virtually any object can be used as a flowerpot. While you can plant a flower in any opening that does automatically mean it will thrive. To make it work you need to mimic a traditional flower pot and the main key to success is drainage. When you water the geranium in the coffee pot, there is nowhere for the water to go since it lacks a drainage hole. If water is allowed to build up in the container, your plant’s roots will certainly rot. In order to avoid this scenario, the container will need drainage. If the container has a pliable bottom, feel free to drill holes in it. Each container will benefit from four or five holes. If you are planting in a glass coffee pot that cannot be drilled you will need to create artificial drainage. This can be accomplished with several mediums. Regular gravel added to the bottom of the container will soak up a lot of the water. Broken pottery is a great option as it allows for plenty of drainage between the fragments, but few people have copious amounts of broken pottery sitting on a shelf. My personal favorite is the use of soda cans. Most families have them and if you don’t, chances are good you can find some in the break room’s trash can at work. Soda cans are made out of aluminum so they will not rot or rust; they are large in size and can be bent to fit into odd shapes. Roughly one quarter of the container should be dedicated to drainage material. To further improve the drainage, the soil should be amended. A typical potting soil becomes very heavy and thick with time. The soil holds the water, which hurts the plant. When I have a container without drainage and even at times when a container does have drainage holes, I add coconut coir shells. These are purchased online and can be found at some gardening centers and orchid retailers. The coconut chips are about the size of a quarter and improve drainage by breaking up the condensed potting soil. Vermiculite and perlite are other good additives for drainage. When it comes to what plants to use, I recommend “tough” plants. The lack of drainage can make many plants unhappy, even with improved drainage. Due to this I would not use “finicky” plants like begonias, caladiums or impatiens. These plants can struggle when planted in a regular flower bed and definitely do not like to be waterlogged. Better plants include geraniums, portulacas, snap dragons and coleus. 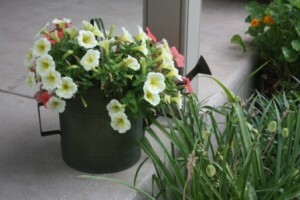 These annuals can handle hot temperatures with average soil drainage. Remember to fertilize your special containers as the plants still need food to grow. Water the flowers when you can tell they are starting to get dry, but before they are bone dry. Don’t be afraid to experiment and see what grows. You are bound to have a plant that dies and when it does, rip it out and replace it with something that is working. Keep your eyes open around the house for a container; look at your friends’ houses and at browse yard sales for deals. Give it a go and see what grows. Lyndsey Roth is a regular Garden & Greenhouse contributor.